Gearhouse Broadcast launches OB/DSNG production vehicle in Dubai. 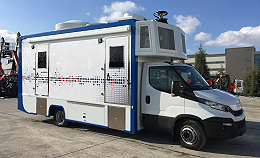 Dubai, March 2016: Gearhouse Broadcast Gulf, the Middle Eastern arm of leading broadcast services specialist Gearhouse Broadcast, has launched a privately owned multi-functional outside broadcast production vehicle with DSNG capabilities. The Iveco 70C17 is fully 3G and HD compatible and runs six main Hitachi SK-HD1300E cameras with two optional Vislink RF cameras, and will be available to rent throughout the Middle East. Built by Hitachi Kokusai Electric Turkey, the vehicle is being debuted on its stand at CABSAT 2016 (ZA1-30) between 8-10 March in Dubai. Flexible and featuring the latest technology from trusted industry vendors, the vehicle is well suited to provide facilities to local production teams or international crews shooting in the region. Its implemented workflow is suited to servicing a number of events including outside news broadcasts, political events, award ceremonies or sports.